It might be a little on the kid-friendly side, but The Game Plan hits all the right notes for a family comedy, and the championship game at the end of the movie is no different. 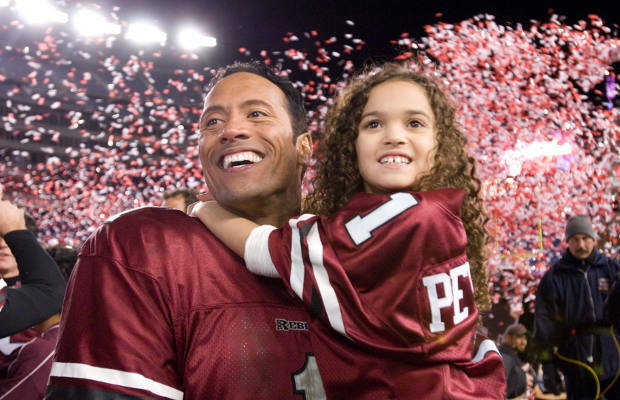 Instead of starring a pretty-boy actor who doesn’t look tough enough for flag football, this movie stars The Rock, who was actually a defensive tackle for the University of Miami 1991 championship-winning team. The movie is in the Disney mold, but the in-game footage is just as rough as anything you would find on Sunday afternoon. There are some really hard hits here that don’t come across as overly-choreographed, and look borderline dangerous. The movie also features booth commentary by Boomer Esiason and Marv Albert, who apparently just announces everything at this point.